The Factory Farming Awareness Coalition, formerly known as the Coalition to Fight Factory Farming, was founded by Katie Cantrell in 2010 in Berkeley, California. We are an educational non-profit committed to empowering people to save the environment, animals, and our own health through our daily food choices. Our presentation has been used as a resource by activists from coast to coast, and we currently have 20 trained presenters in the San Francisco Bay Area. Much of the presentation is based on Jonathan Safran Foer’s book Eating Animals. His book inspired Katie to create a presentation that encompasses the wide range of interconnected issues affected by industrial agriculture. By exposing people to the true impacts of factory farmed products, we seek to spread awareness and empower the public to make informed, conscious food choices. Every meal we eat can be a powerful form of activism. If you were asked to name a single industry that was one of the leading causes of climate change, water pollution, deforestation, and resource depletion, what would you guess? Perhaps the oil and gas industry? The answer is the animal agribusiness industry. This might seem shocking to a lot of people, especially if you look around at the products at the grocery store. How could Old MacDonald be destroying the environment? 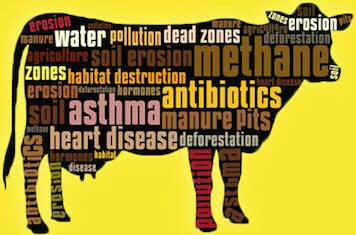 There are currently 9 billion animals raised and killed for food every year in the U.S., 99% of them on factory farms. All of those animals are eating, burping, and pooping. And that’s where the environmental issues come in. They’re eating GMO soy and corn grown on deforested land, farting and burping greenhouse gases 200x worse for the climate than CO2, and pooping millions of tons of manure that leeches into local waterways. But there’s good news! Our food choices have a tremendous environmental impact. That’s why this Earth Day, FFAC set out to talk to people about how changing our eating habits is one of the easiest & most delicious ways to go green(er).